Microsoft today expanded its partnership with Klout with the launch of Snapshots on Bing. The feature allows you to tie your name to your Klout account so that when someone tries to find you on Bing, they’ll see your various social accounts. Snapshots on Bing let you sign up to verify and manage how you appear in Bing search results, based on your public social network profiles. You’ll now be able to easily share your professional accomplishments and highlights, as well as your most influential moments on Instagram and Twitter, all of which will be displayed when you’re looked up on Bing. Links to your connected social profiles. Klout Score and influential topics. Two of your most influential public moments from Twitter (over the past 7 days) and Instagram (over the past 90 days) . Bing already features Klout integration, in addition to Facebook, Twitter, Foursquare, Quora, and even Google+. Klout has even integrated Bing’s search results into its Klout Score as a direct indicator of real world influence. Yet this takes things a step further by actually letting you tie your Klout account to your name on Bing. This is a bigger win for Klout than it is for Microsoft. 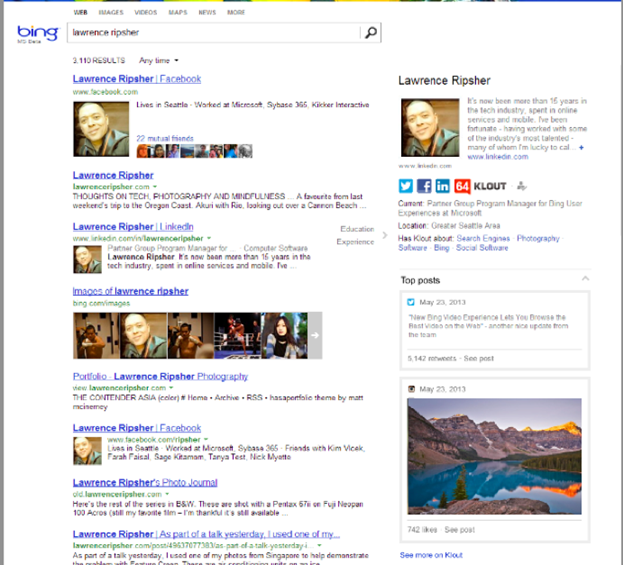 The problem here is that Bing doesn’t let you tie your name to other social networks like Facebook, Twitter, or Google+. To claim your Bing Snapshot, you will need a Klout account that is connected to your LinkedIn profile. If you haven’t signed up for one, or neither, this will take a lot of effort. There will be those that see this as a cool addition to Bing and will rush off to link their names. Everyone else will scoff and not bother getting a Klout account just for this. We think this is a mistake. Klout is not for everyone. Microsoft should have rolled out Snapshots on Bing as a feature for all social networks, or at least a few of the popular ones. If I want to verify my account on Bing, why can’t I do it without Klout?